The presentation of the Dede Korkut Chamber Orchestra, organized under the auspices of the International Turkish Culture and Heritage Foundation, was held at the International Mugham Center on September 20. The event, which was attended by representatives of diplomatic corps accredited in the country, representatives of international organizations, well-known figures of science and culture, public figures, musicians, was held as part of the 10th Uzeyir Hajibeyli International Music Festival. Addressing the event, President of the International Turkish Culture and Heritage Foundation Gunay Efendiyeva spoke on the work done by the organization. The International Turkish Culture and Heritage Fund has been established with the support of the Presidents of Azerbaijan, Kazakhstan, Kyrgyzstan and Turkey. The Foundation works to preserve and promote the cultural heritage of the Turkic peoples. At present, the International Turkish Culture and Heritage Foundation is working on various projects aimed at protecting and promoting the historical and cultural heritage of the Turkic-speaking peoples. It was stressed that one of such projects is the creation of the Dede Korkut Chamber Orchestra. The Dede Korkut Chamber Orchestra, which is named after the main hero of " The Book of Dede Korkut ", the most famous epic of the Turkic world, unites musicians from the Turkic world. At the 6th Summit of the Cooperation Council of Turkic Speaking States held in Kyrgyzstan earlier this month, this initiative was reflected in the Declaration signed by the heads of the member states. The art director and conductor of the orchestra is People's Artist of Azerbaijan, Professor Yalchin Adigozalov. The orchestra works to promote the rich culture and art of the Turkic world, folk music and works of great composers. The orchestra aims t perform the music of Turkic peoples on the international platform in this direction. Gunay Efendiyeva said that this year marks the 100th anniversary of Azerbaijan Democratic Republic and the Caucasus Islamic Army. The spectacular parade that we saw a few days ago once again demonstrated the eternal friendship and brotherhood between the two Turkic-speaking states. It was noted that this year also marks the 95th anniversary of the great national leader of Azerbaijan Heydar Aliyev, who always supported the unity of the entire Turkic world and strived for its development and strengthening. At the same time, the 90th anniversary of the great Kyrgyz writer Chingiz Aitmatov, the 100th anniversary of prominent Azerbaijani composer Gara Garayev is celebrated with a series of events. Each of them is the giant figures of the Turkic world. The President of the Foundation expressed her gratitude to the people of Nakhchivan for saying that several concerts will be held in Nakhchivan on September 22 as it was declared the capital of Islamic culture for 2018. 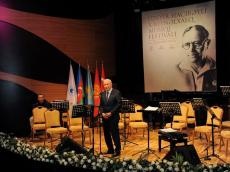 First Deputy Minister of Culture Vagif Aliyev spoke about the importance of the music festival named after genius composer Uzeyir Hajibeyli. The geography of the festival, which has already been held for the tenth time this year, has expanded. Famous music collectives have joined the festival. He stressed that the International Turkish Culture and Heritage Foundation has done a great deal of work in the shortest possible time. The Foundation, which has signed new projects aimed at the realization of its goals. Further, the guests enjoyed the works of Azerbaijani, Turkish, Kazakh and Kyrgyz composers.